Severan Basilica, Leptis Magna. Image Souce: Sascha Coachman/Wiki. 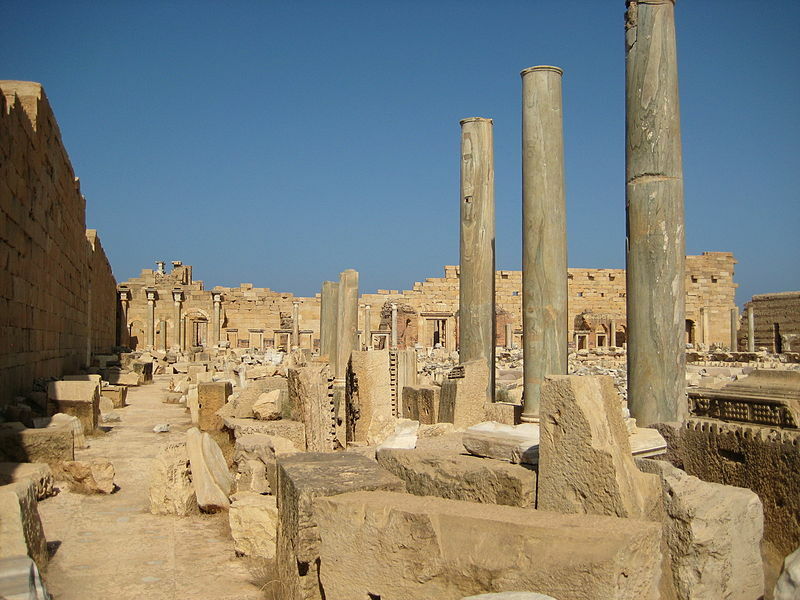 Leptis Magna, Libya’s most important archaeological site, has not been engulfed in fighting as the country’s conflict enters its fifth month. 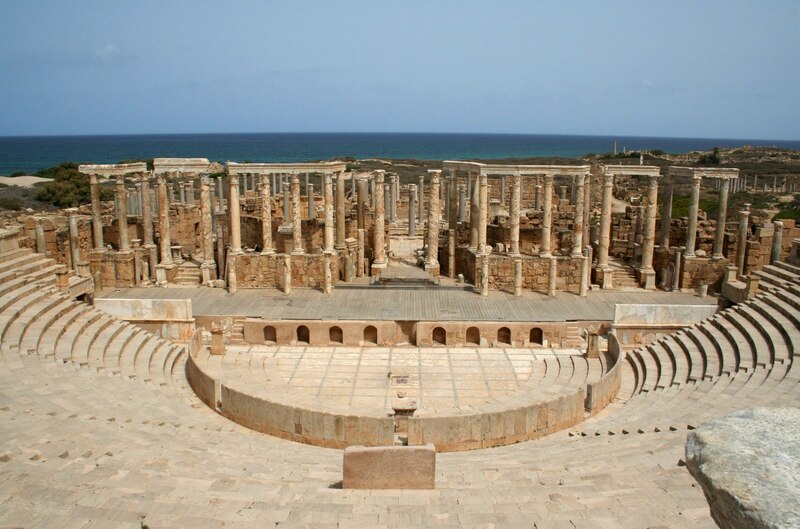 But airstrikes have been carried out nearby, and Libyans on both sides of the battle worry that the U.N. World Heritage Site could sustain damage if rebels in the east push toward Tripoli. 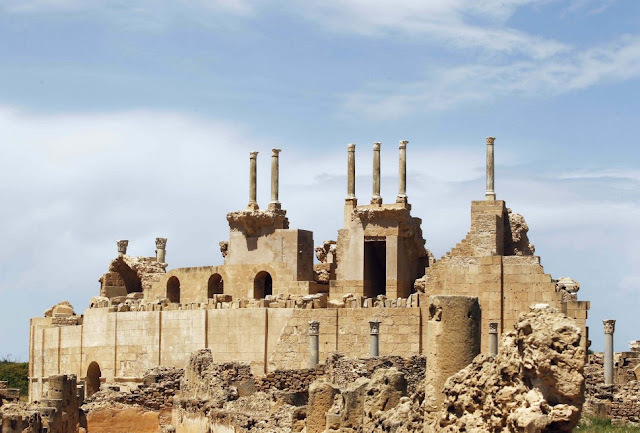 Alarm about the archaeological site soared this week after NATO officials said they could not rule out bombing in the area if Gaddafi’s troops are found to be using it as a military staging ground. Susan Kane, a professor of archaeology at Oberlin College in Ohio who has done extensive work in Libya, said Libyan contacts she deems credible have told her the government is storing munitions in cultural sites, such as museums and ruins. She said that fighting around Leptis Magna would be a tragedy. 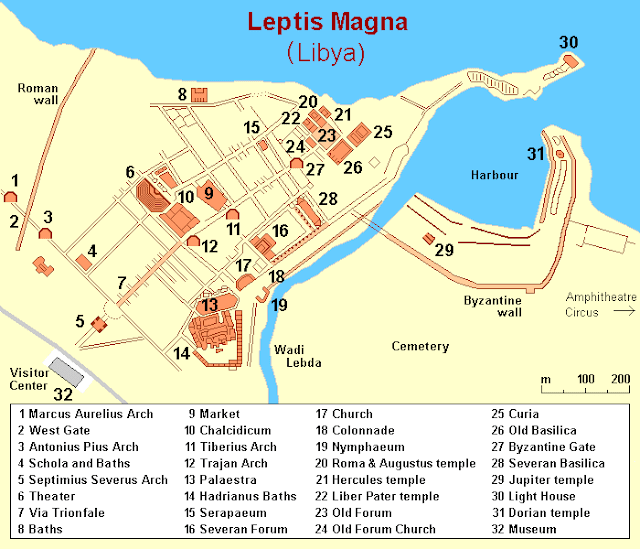 Leptis Magna was one of the most prominent cities in the Roman empire. 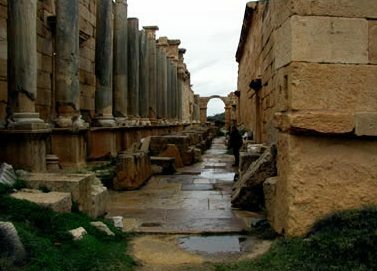 Its high state of preservation means that walking through it is like walking back in time. 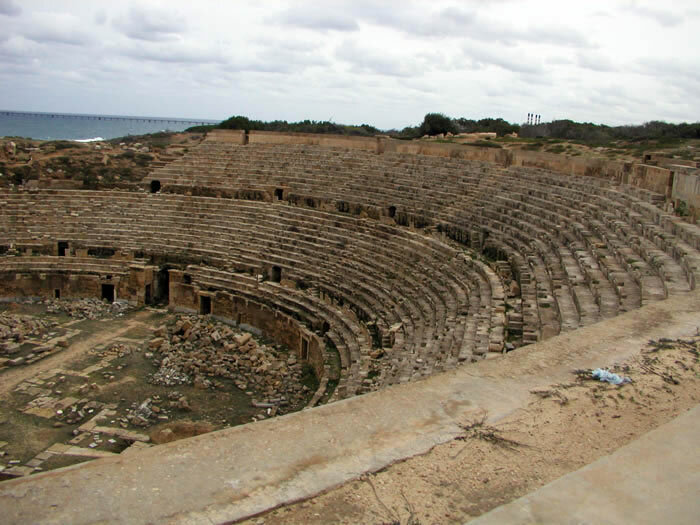 Founded in the Bronze Age around 1100 BCE by the Phoenicians, it became part of the Roman Empire in 146 BCE when the Romans defeated Carthage. Under the Emperor Septimus Severus, who hailed from the city, Leptis Magna became the third most important city in Africa. 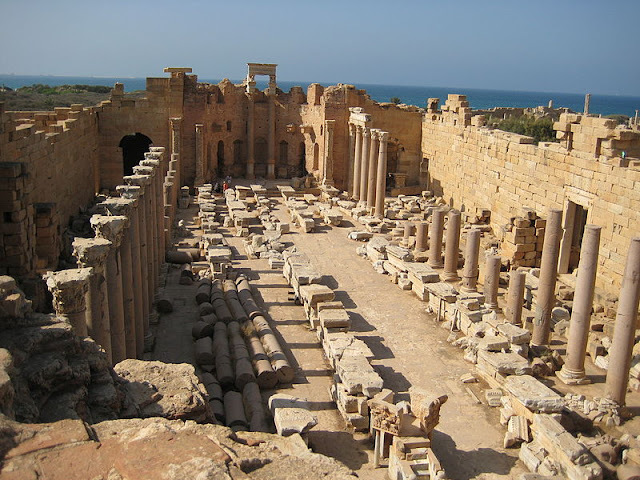 With Rome's decline, Leptis Magna became a provincial capital in the Byzantine Empire in the 6th century CE. 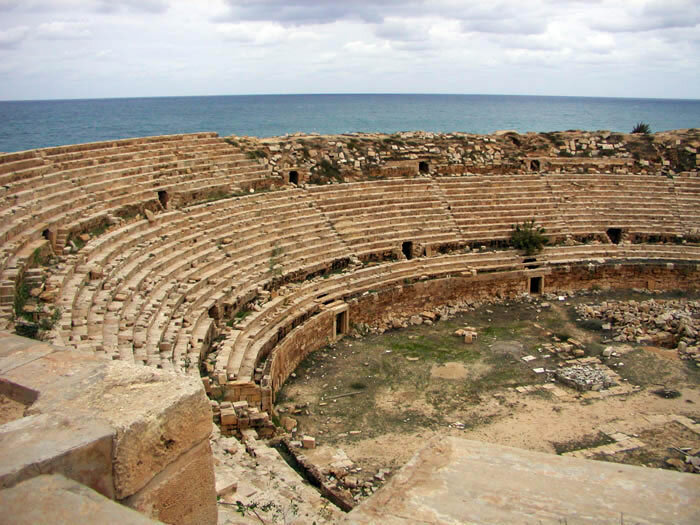 It was the site of a massacre in 543 CE. The city was abandoned by the 650s, except for a Byzantine garrison. 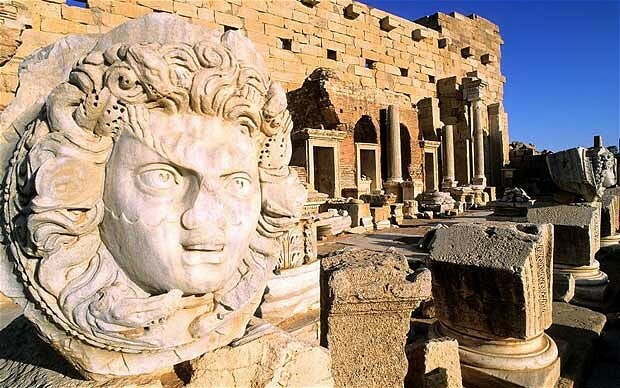 Its 1,700 years of habitation ended with the Arab conquest. An illustration of what Leptis Magna would have looked like. Image Source: Temehu. Map of the town. Image Source: Wiki. 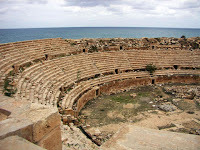 The Theatre. Image Source: 3xploration. 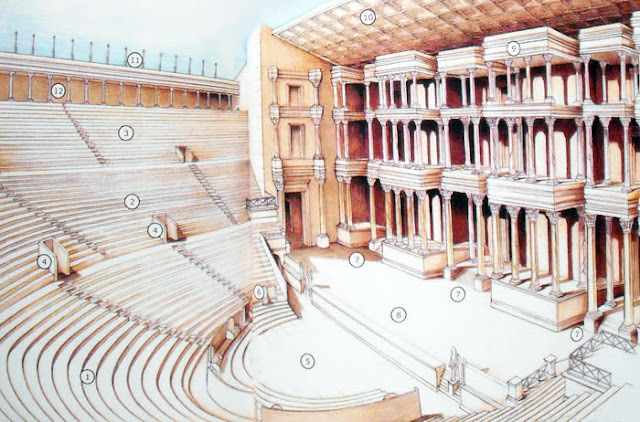 A reconstruction of the theater. Image Source: Temehu. Caption for the above image: (1) Ima Cavea; (2) Media Cavea; (3) Summa Cavea; (4) Vomitori; (5) Orchestra; (6) Seats for important dignitaries; (7) Entrance to stage; (8) Stage; (9) Wall of scenery; (10) Wooden ceiling; (11) Stakes to secure the canvas awning; (12) Attic gallery. 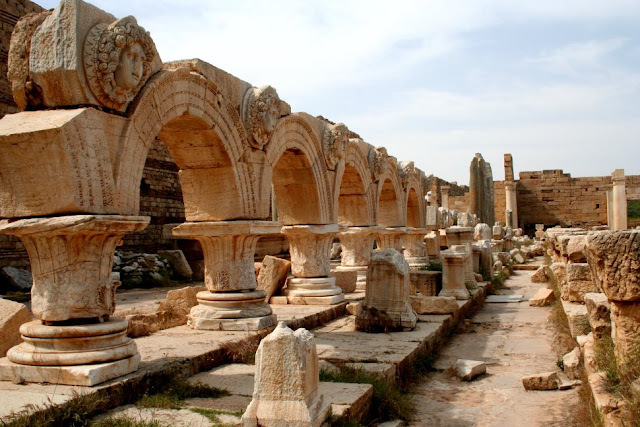 Pilasters inside Basilica of Septimus Severus, Leptis Magna. Image Source: Sascha Coachman/Wiki. 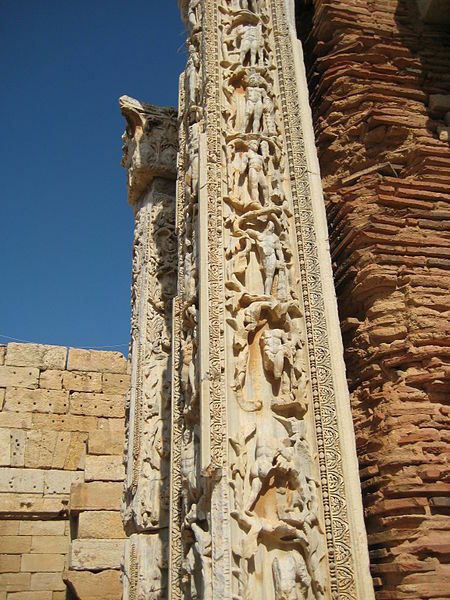 Element of Basilica of Septimus Severus, Leptis Magna. Image Source: Sascha Coachman/Wiki. 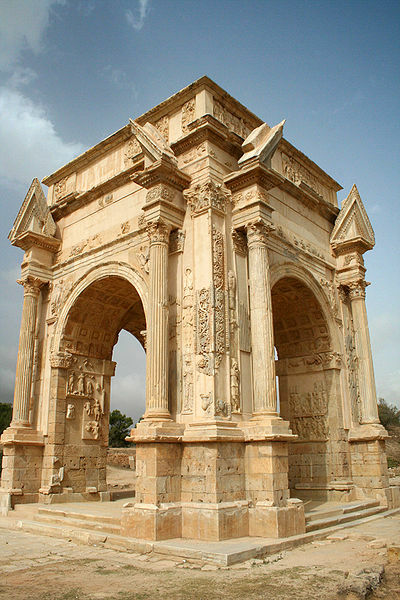 The Arch of Septimius Severus at Leptis Magna. Image Source: David Quinn/Wiki. 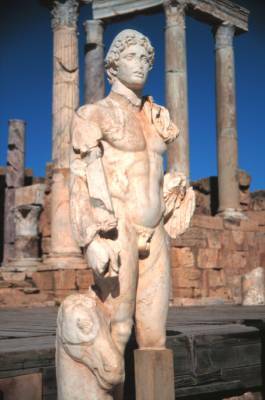 Statue in the Law Courts theatre at Leptis Magna. 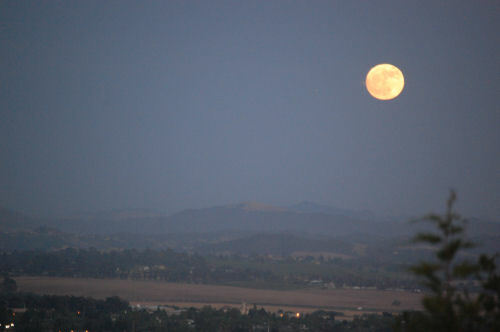 Image Source: Horizons Unlimited. The Forum. Image Source: Sascha Coachman/Wiki. 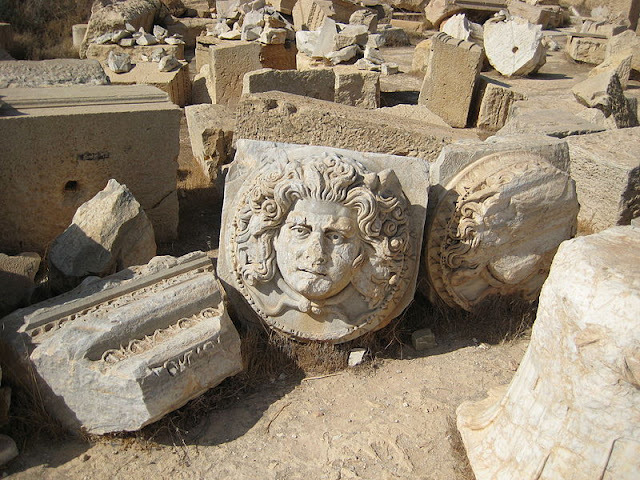 One of the Medusa heads, Forum in Leptis Magna.Image Source: Sascha Coachman/Wiki. The Market. Image Source: Robert Bamler/Wiki. The Marketplace. Image Source: Sascha Coachman/Wiki. 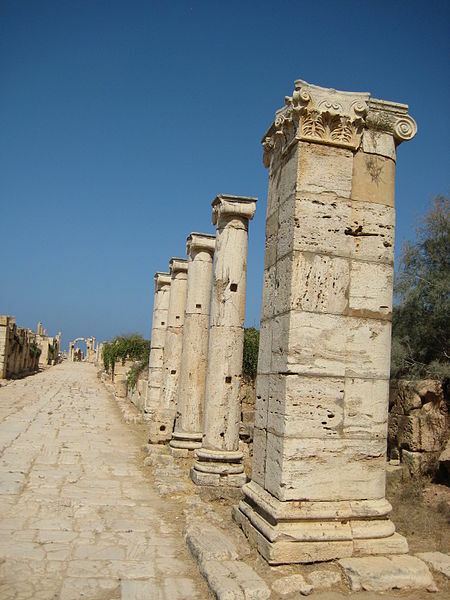 Street view, from Septimius Severus Arch to Trajan Arch. Image Source: Sascha Coachman/Wiki. Street view. Image Source: Temehu. 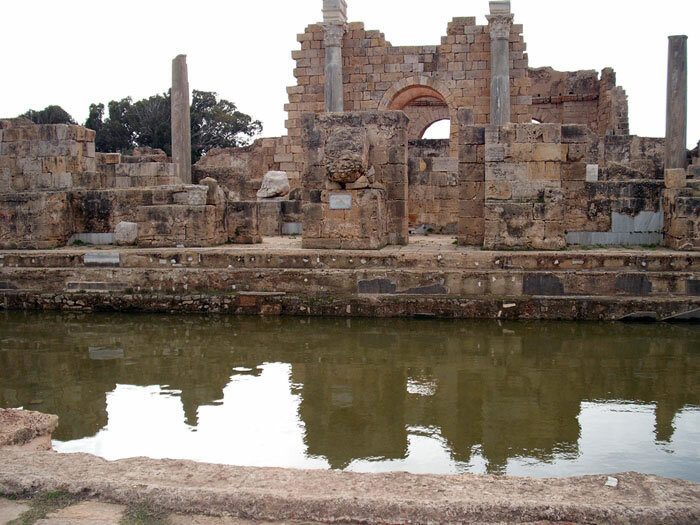 The Hadrianic Baths. Image Source: Temehu. 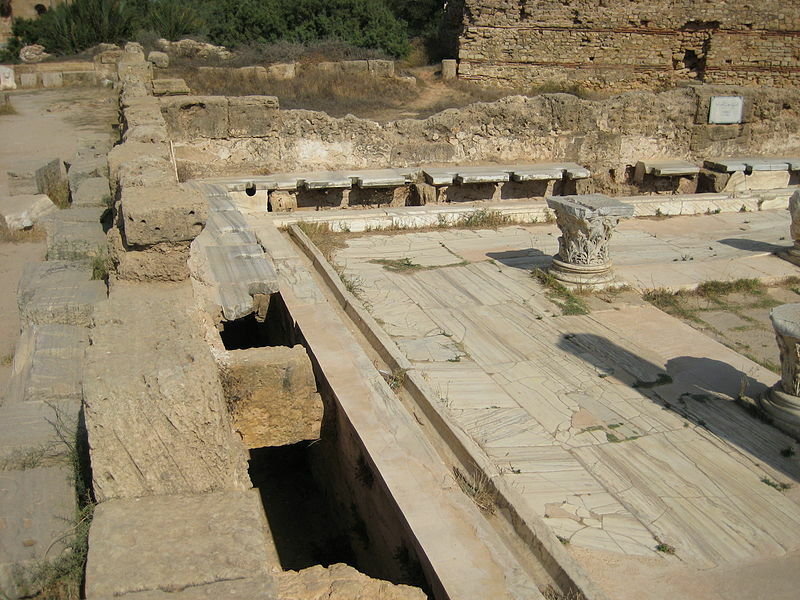 Latrines, Leptis Magna. Image Source: Sascha Coachman/Wiki. The Libyan Goddess Medusa (or the Gorgon) Guarding the Severan Forum. Image Source: Workbase Info. Villa Silene. Image Source: Temehu. 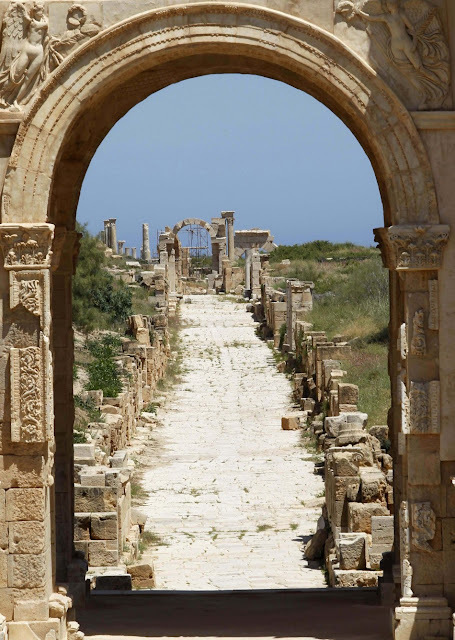 Caption for the above photograph: Villa Silene is a private house of a wealthy owner from Leptis Magna, dating back from the Byzantine period. Overlooking the magnificent Mediterranean sea the villa is widely recognised as one of the must-see places in Libya, especially its lavish decorations and the highly detailed and intricate mosaics across the villa's floor, including sea nymphs, animals, geometrical designs and amphora-helmeted pygmies. Mausoleum of Qaser Duirat, 200 AD., Leptis Magna Museum. Image Source: Temehu. 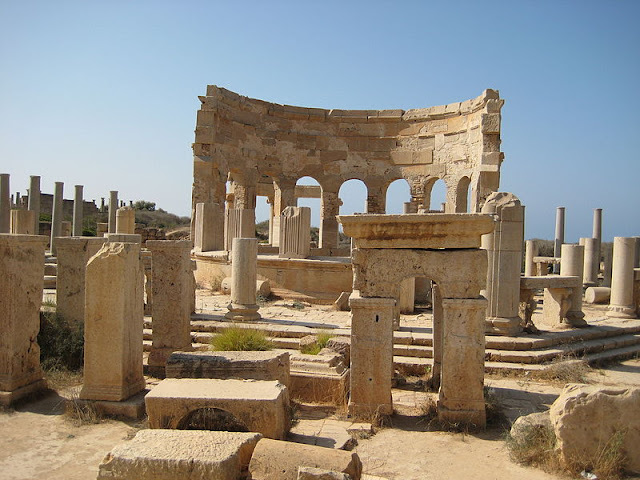 Caption for the above photograph: The original location of this funerary monument was about 2 kilometres south-west of Leptis Magna city (Lubdah). 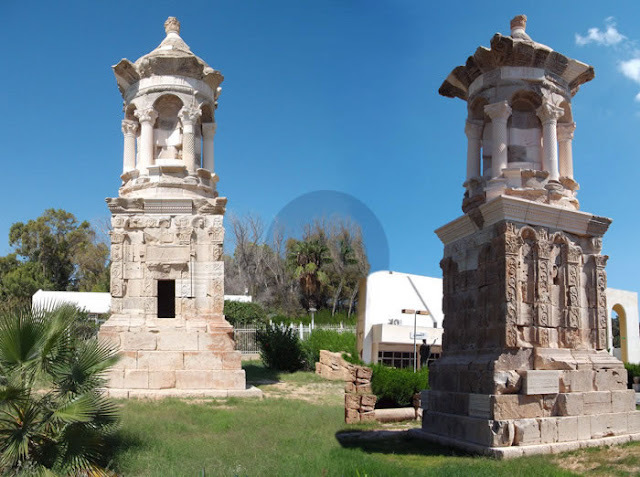 It was moved to its current location outside Leptis Magna museum for safety reasons, owing to the high voltage pylons which passed by its previous location. This mausoleum is among the best preserved mausoleums and most decorated of all the Mausoleums found in Libya. Among the designs are the zodiacal and astrological signs. The name found inscribed on the monument is half Roman and half Libyan, which indicates that the tomb belonged to a Libyan dignitary, as it was the custom then for dignitaries to keep their Libyan name in order to indicate their ancestry. 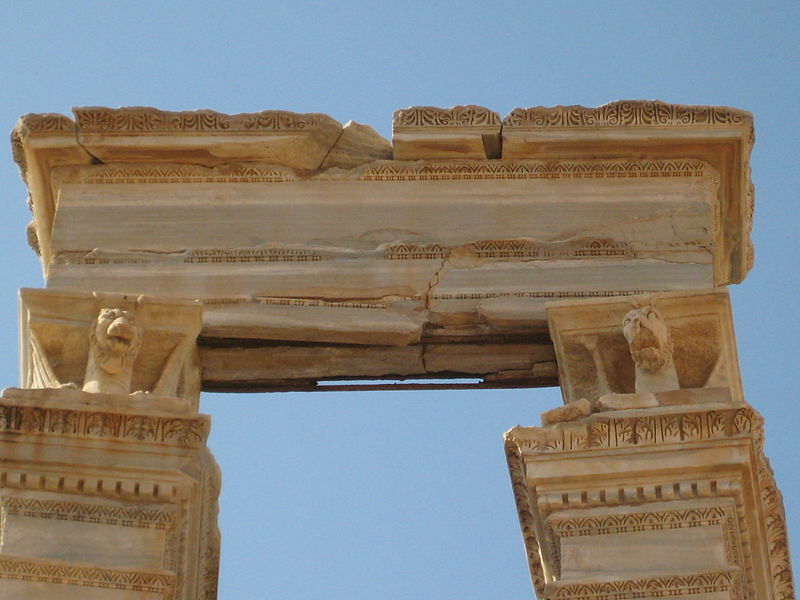 The structure was dated to 200 AD. 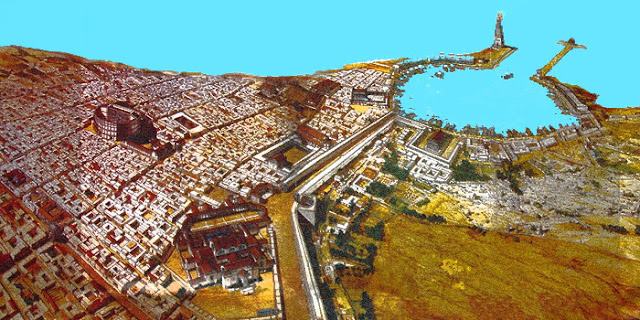 In 2005-2006, a team from the University of Hamburg, including Helmut Ziegert and Marliese Wendowski uncovered an astonishing 30 foot wall of mosaics from the 1st-2nd centuries CE (reports here and here). 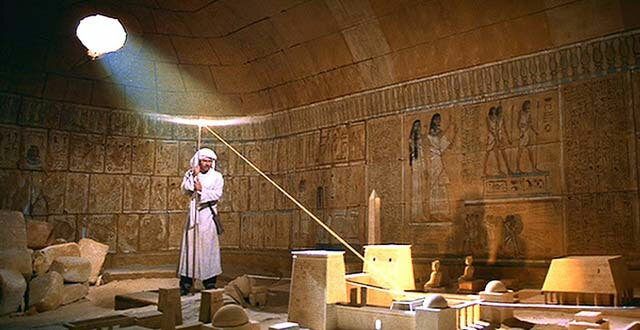 Ziegert, incidentally, is known for uncovering the Palace of the Queen of Sheba in 2008 in Ethiopia, and a possible resting place for the Ark of the Covenant, bringing him into Indiana Jones territory (see report here). From Workbase Info: "The mosaics show with exceptional clarity depictions of a warrior in combat with a deer, four young men wrestling a wild bull to the ground, and a gladiator resting in a state of fatigue and staring at his slain opponent. The mosaics decorated the walls of a cold plunge pool in a bath house within a Roman villa at Wadi Lebda in Leptis Magna. The gladiator mosaic is noted by scholars as one of the finest examples of representational mosaic art ever seen." More mosaics from the city can be seen here. Only about one-third of Leptis Magna has been excavated. Regatta of Cupids, detail. 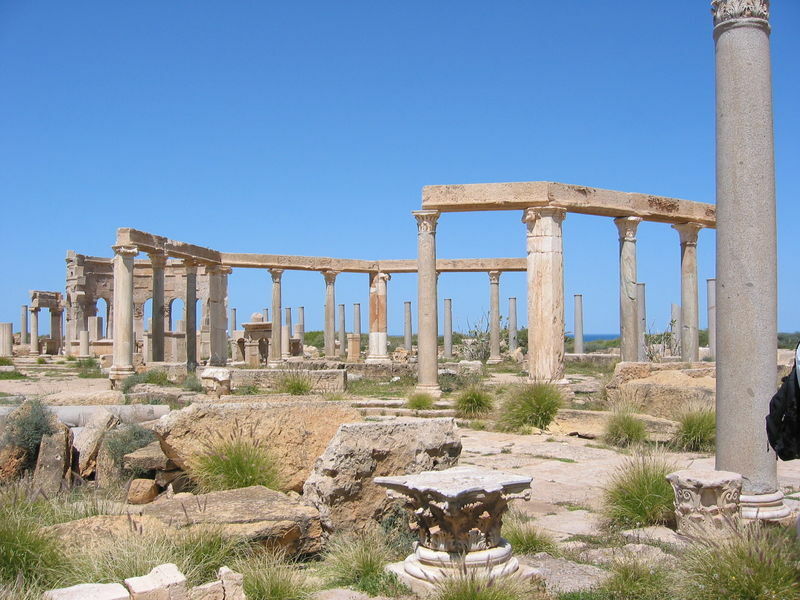 From the Nile Villa at Leptis Magna. Roman, 3rd CE. Mosaic, 380 x 118 cm. Image © Gilles Mermet / Art Resource, NY. 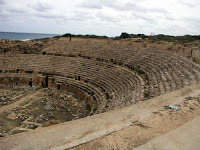 Gladiators' Arena. Image Source: Temehu. Points of Departure II: Nijinsky Variations (1996) © Peter Milton. The blog is going on a summer interlude while I polish off some work on other projects. I will post weekly pieces between now and summer's end - more if events merit it. Regular posting will resume in late August. 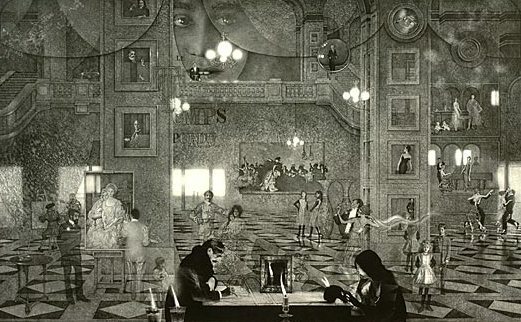 For today: check out these remarkable, time-tossed, surreal images by Peter Milton. 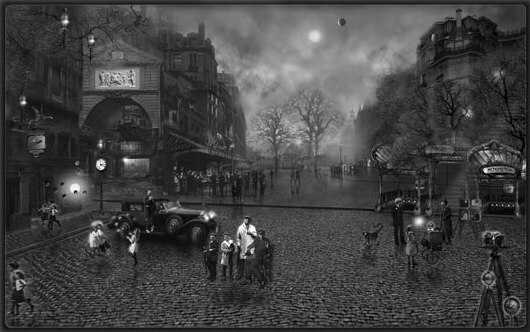 All images are © Peter Milton and found on his Website; you can see an animation of how he changes the same scene in different prints here (Hat tip: Woods Lot). 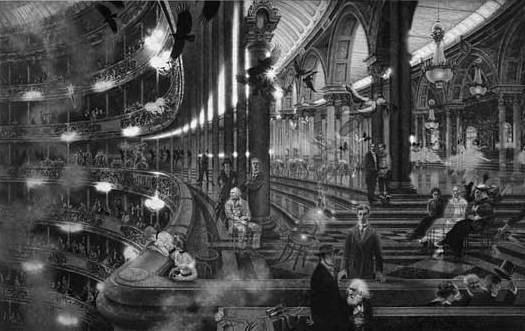 There's a bit of Edward Gorey in these art pieces, as well as some neo-Realist-Impressionist touches, neo-Art Nouveau, Steampunk, Escher, and some Piranesi. But the overlapping, ethereal, mental-physical realities, along with the neo-fin-de-siècle temporal themes, are pure turn of the Millennium. In Search of Lost Time (Second State: Visions and Revisions [No. 123]) (2006) © Peter Milton. Sight Lines III: Eclipse (2011) © Peter Milton. The Wolfriders' Holt in the Original Quest. "Wolfsong," Elfquest #4. Boing Boing recently reported that all 6,500+ pages of the comics cult saga Elfquest are now online, to read for free. In fact, they've been up since 2009, and were generously posted by their creators, who initially set a milestone by self-publishing their issues; you can read them here. Published from 1978 up to 2007 (with more stories promised, and long-running plans for a movie), these comics are an American classic of pulp fiction and pre-manga story-telling (read a review here). In an earlier post, I talked about DC Comics stories that caught my attention. This is another title that made me a fan and a collector. The Wolfriders encounter Savah, leader of desert Elves known as the Sun Folk in the Original Quest. "Raid at Sorrow's End," Elfquest #2. Drawn and written by Wendy Pini and written and edited by her husband Richard Pini, Elfquest is a mesmerising tale that spans millennia, about an Earth-like world inhabited by primitive humans. The World of Two Moons is forever changed, however, when a race of alien Elves, called High Ones, lands on the planet. They hail from a society of advanced technology, but only develop their inner abilities once they relinquish their dependence upon tools and weapons. Their spaceship is driven by Elvish psychic and physical powers, which appear to terrified human observers as magic. The 'Original Quest' - the first Elfquest story ever published - however, begins long after this huge event. By this time, the Elves have dispersed. They have adapted to this world. Different tribes of Elves form close psychic bonds with creatures such as wolves, elk, eagles and dolphins, and build their respective societies around those bonds. But they are all characterized by their hazy and legendary cultural memories of a lost central experience. They all yearn to find the original spaceship that brought them, the Lost Palace of the High Ones. The main protagonist, Cutter, a wolf-riding Elf leader, plans to find the Palace and unite all the Elves, the scattered children of the High Ones. Along the way, he meets many different Elves, including one of the best villains in comics, the Glider Winnowill. This isn't an alternate timeline, this is the only timeline. Booster Gold #44 (July 2011). Tomorrow, DC's solicitations for September comic books come out. But for the past two weeks, they have been releasing news about their rebooted fictional universe that will arrive that month. For those who don't bother with pulp fiction, this matters because the company, which owns Superman, Batman and Wonder Woman, is doing a complete overhaul of all its series, based on a gigantic crazy time warp storyline it's putting out this summer called Flashpoint. And it's the time warp story that interests me, because it involves the renumbering of all titles to coincide with the first historical transition in comics from paper to digital formats. There's a history of DC's notorious reboots here at Comics Alliance. Of this one, CA said: "Flashpoint Throws Out the Bathwater, Baby Reported Missing." Image Source: Paramount via Gizmodo. Thirty years ago today, the legendary hit film Raiders of the Lost Ark, which was helmed by American director Stephen Spielberg opened in cinemas. A travelling international exhibition, currently at the Montreal Science Centre, features props from the movie contrasted with actual archaeological artifacts. For a report on the exhibition and where it will go next, go here.